There are many ways to serve and get involved at St. Brigit. Below are just a few examples of what’s already in place. You may want to join one of the existing ministries or share your passions and create a new way for you and others to serve the community of St. Brigit or the broader community in which we live. 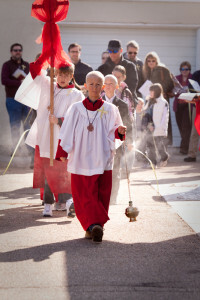 Acolyte – Adults and Youth acolytes assist the clergy during worship services by lighting candles, carrying the cross during the procession and helping the clergy set the table. Altar Guild – A quiet and behind the scenes ministry, the Altar Guild members prepare the bread and wine for each worship service. They also prepare for the special services such as weddings, funerals and baptisms. Other duties include cleaning the vessels and laundering the linens. Building and Grounds- Caretaking 8 ½ acres of property is more than a full time job. If you delight in gardening or working outside we would welcome your help. Please contact our Jr. Wardens, David and Shelly Arnold and they will welcome you with open arms. 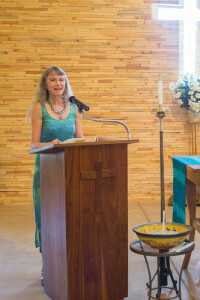 Chalice Minister – Administering the cup of wine during communion requires one to be a confirmed Episcopalian. A short training class is required. Choir Member- Do you enjoy singing or making a joyful noise? Then the St. Brigit choir might be for you. 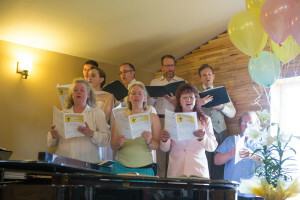 The choir sings monthly following the school schedule taking summers off. Coffee Hour Host – Coffee Hour hosts provide hospitality by bringing snacks to share with others following Sunday morning worship, setting out coffee (and coffee accoutrementent) and cleaning up afterwards. Eucharistic Visitors – Members of the congregation who take communion to those people who are unable to attend Sunday morning worship. Training is held periodically throughout the diocese to participate in this ministry. Sunday School Teacher – These members have a passion for children and long to help them grow in the knowledge and love of God. All regular Sunday School Teachers are required to take Safeguarding God’s Children. Your help in this very important ministry will support the children as they grow closer to God and one another. Greeter/Usher – These members provide hospitality to everyone who comes on the St. Brigit property. Greeters are on the lookout for those that are new to insure they feel welcomed and at home. They pass out bulletins, oversee the offering collection and counting, and record how many people are in attendance at each worship service. Growth Team- The Growth Team at St. Brigit is prayerfully and intentionally looking at ways to grow our community of faith numerically. Members of this team evaluate and oversee our visibility within the community and think creatively about how we can become more active community members in the Carbon Valley. Healing Prayer Team – The members of the healing prayer team offer healing prayer on Sunday morning during communion. Training is available for those who feel called to this ministry. Lector – Lectors read the scriptures from the Hebrew Bible and the New Testament during worship services. 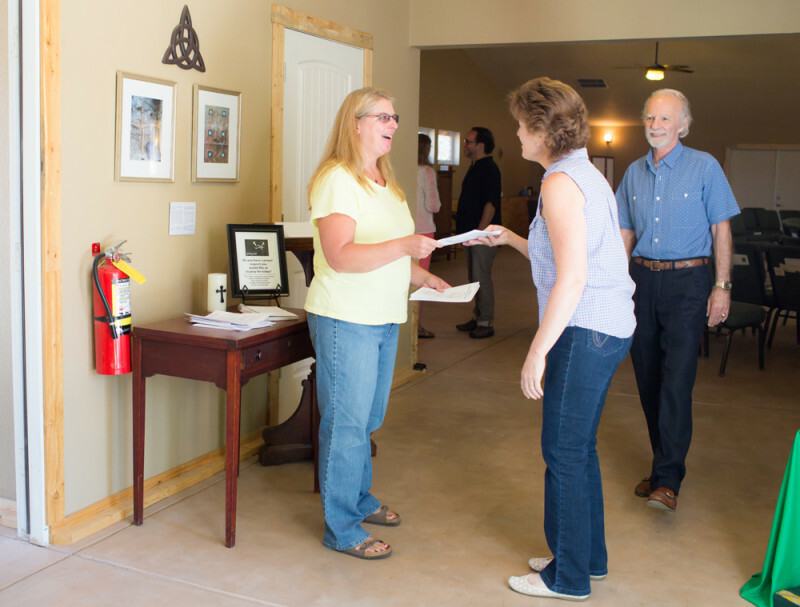 Welcoming Committee – Being a part of this ministry involves welcoming newcomers to our church with a St. Brigit coffee mug and a loaf of homemade honey whole wheat bread. Worship Team- The Worship Team meets to create and evaluate liturgy. They anticipate high holy days and what is correspondingly going on in the world. With these both in mind they create and plan meaningful and enriching worship to include and engage all who attend.